Christmas is still a way off, but I know some of you are starting to think about your Christmas cards. It’s a big project, making all those special cards to celebrate such a special holiday. I’ve been working on putting together some of my old gathering and workshop projects that have been just sitting on my shelf. I’ll be sharing a few of these, which all happen to be Christmas cards, over the next little while. The first card I’m going to show you is one I used for a gathering a couple of years ago. It’s one of my favourite designs. It’s such a simple pattern and yet can be very striking. 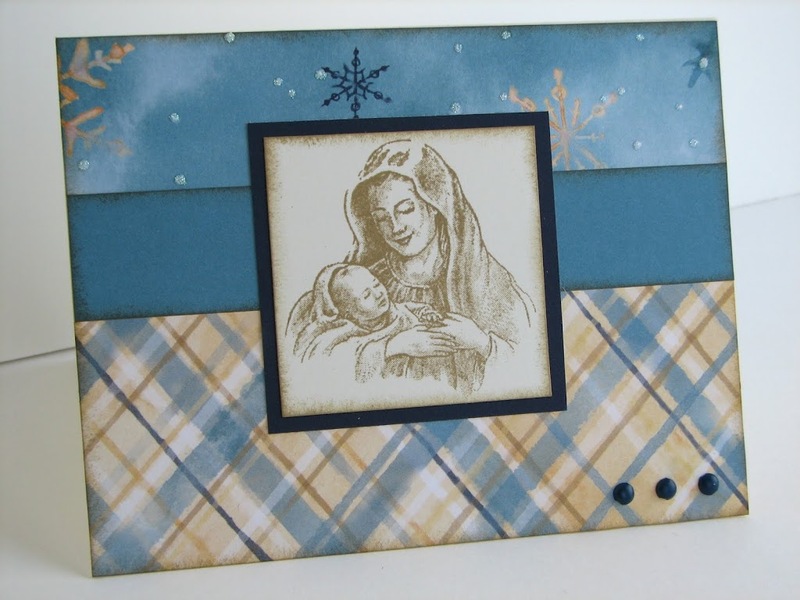 I have used the Aspen paper pack here, along with Twilight, Outdoor Denim and Colonial White cardstock. The image is from an older stamp set called No Greater Love and is stamped with Desert Sand ink. All the papers are sponged with Desert Sand as well. As finishing touches I added 3 Outdoor Denim brads and some Glitz Glitter Gel to the snowflakes in the paper. There is another reason I love this card. The image I chose to stamp holds special meaning for me. It reminds me of the real reason I and my family celebrate Christmas: my Saviour’s birth. It sometimes blows my mind that the God of the universe would send His powerful Son to earth in the form of a helpless baby. Such love! Stay tuned for other cards with snowmen, stars, and more. Very pretty! Love that stamp!